Keeping up a rapid-fire launch pace, a SpaceX Falcon 9 rocket boosted a Thai communications satellite into orbit Friday -- the company's second commercial comsat launch in three weeks -- and then successfully recovered the booster's first stage with a televised, rocket-powered descent to the deck of an offshore drone ship. It was the second successful off-shore landing in a row for SpaceX and the company's fourth first-stage recovery overall as company founder Elon Musk continues his push to reduce launch costs by recovering, refurbishing and eventually reflying spent stages. But the re-entry and landing, like one carried out May 6 after launch of a Japanese communications satellite, subjected the booster to extreme heating because of the demands of the trajectory required to boost the Thaicom 8 relay station into the high orbit required for such communications satellites. After the May 6 landing, Musk tweeted the booster suffered "max damage" of the three stages successfully recovered to that point. There was no immediate word on the health of the rocket stage recovered Friday, but it appeared to be in remarkably good shape on its landing legs atop the "Of Course I Still Love You" drone ship stationed 420 miles east of Cape Canaveral. 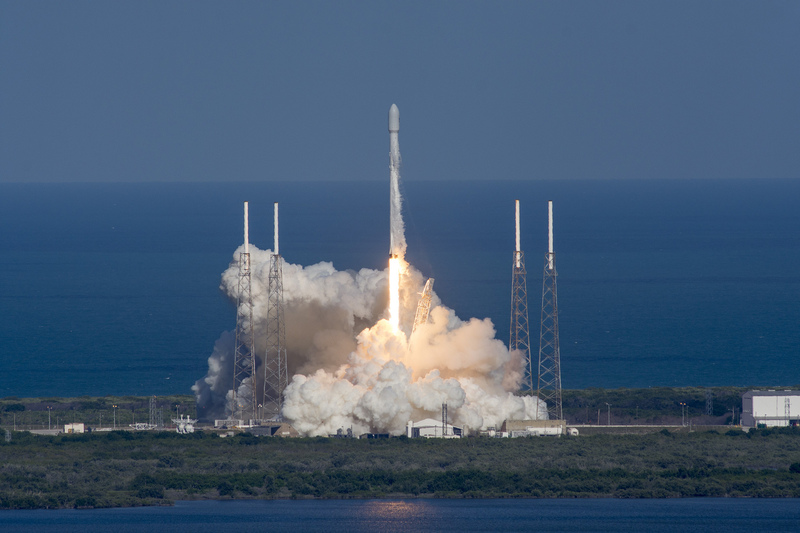 And in any case, the primary goal of the flight was to put the 6,669-pound Thaicom 8 communications satellite into orbit and the Falcon 9 did just that with a spectacular late afternoon blastoff from Cape Canaveral. Running a day late because of a potential issue with the second stage steering system, the rocket's nine Merlin 1D engines ignited with a crackling roar at 5:39 p.m. EDT (GMT-4) and quickly pushed the booster away from launch complex 40 at the Cape Canaveral Air Force Station with 1.5 million pounds of thrust. Arcing away to the east over the Atlantic Ocean, the first stage powered the rocket and its payload out of the dense lower atmosphere and shut down as expected about two minutes and 35 seconds after liftoff. The first stage then fell away and the single Merlin 1D engine powering the Falcon 9's second stage ignited to continue the climb to space. The first stage, meanwhile, fell back to Earth, and live television views from the rocket showed it firing three of its engines to slow down for re-entry against the brilliant blue-white limb of the Earth. The engines then re-ignited just above the ocean to quickly decelerate. Four landing legs deployed as planned and the booster settled to a picture-perfect touchdown on the droneship. About the same time the first stage was landing, the second stage was wrapping up the first of two "burns" to boost the Thaicom 8 relay station into orbit. Twenty seven minutes after launch, the engine re-ignited for a short burn to complete the boost phase of the mission. The Thaicom 8 satellite, built by Orbital ATK and owned by Thaicom PLC, then was released from the second stage to fly on its own. Over the next few weeks, on-board thrusters will be used to raise the low point of the orbit, putting the satellite in a circular orbit 22,300 miles above the equator. In such orbits, satellites take 24 hours to complete one trip around the planet, thus appearing to hang stationary in the sky. Thaicom 8 satellite, equipped with 24 high-speed KU-band transponders, eventually will be stationed above the equator at 78.5 degrees East longitude, providing telecommunications services to Thailand, Eastern Africa and the Indian subcontinent. Next up for SpaceX is launch of the company's ninth operational space station resupply mission on July 16. The flight originally was scheduled for later this month, but SpaceX requested a delay because of Falcon 9 processing requirements, availability of launch slots at the Air Force station and limitations on how long a Dragon cargo ship can remain docked at the station.